This last month has been houseguest season at our place. The people who stay with us are always people we want to spend time with so it goes without saying that houseguests = dinner parties. Last week Neil’s cousin and our dear friend Malka was in town from Berlin. I made dinner a couple of times, the second time it was more casual and so I wanted a dessert that was familiar, easy to make and looked and tasted good. I’ve been over doing brownies lately so I pulled out a classic favorite: upsidedown cake. Motivated in no small part because one of the Chinese vendors I passed on my way home had fresh pineapples on sale. I was pretty sure I had some sour cherries in the freezer that I had pitted when they were in season and froze for just such a moment. We were going to watch Citizenfour on HBO and I figured we’d eat the cake after. Everyone was sitting in front of the tv when I slipped into the kitchen to invert the cake on the serving plate. When the documentary was over we all came back into the living room, Malka took one look at the cake and said: I can’t believe you made this on a weekday! Which made me laugh. It also made me realize how this very straight forward cake can be so impressive. If you have never made one you should for sure give it a try, you won’t be sorry that you did. 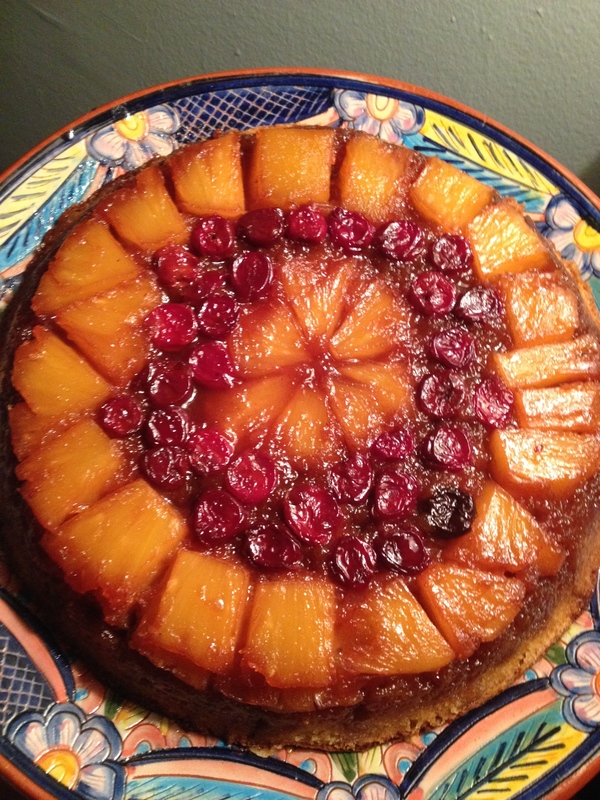 This entry was posted in Recipes and tagged pineapple upsidedown cake, recipe, upside down cake. Bookmark the permalink.